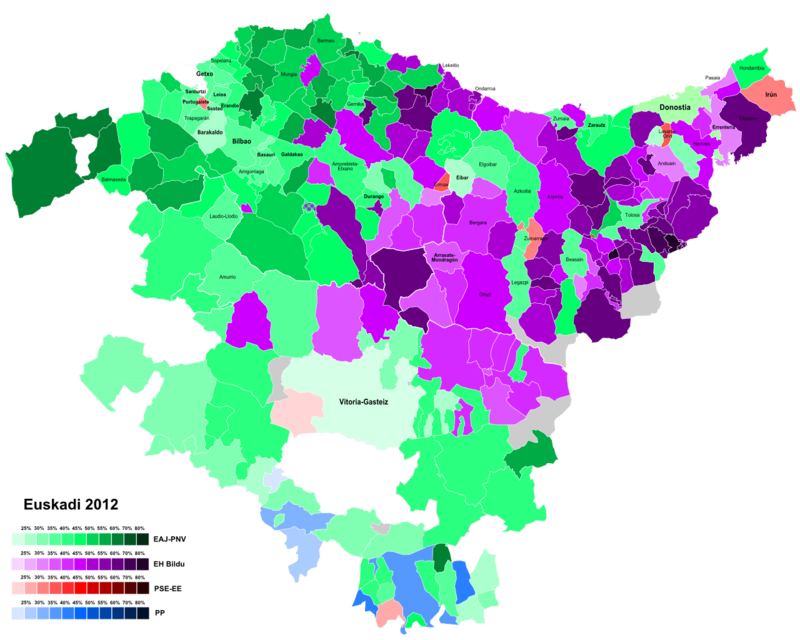 General elections were held in Montenegro on October 14, 2012. The country’s unicameral legislature, the Assembly of Montenegro (Skupština Crne Gore) has 81 members, of which 76 are elected by party-list proportional representation with a 3% threshold and the five remaining seats are directly elected seats reserved for “national minorities” (in the past, only Albanians, but now open to all minorities such as Bosniaks). Montenegro won independence from Serbia in 2006, following a referendum in which over 55% of voters voted in favour of separation (the threshold for independence to pass had been 55% of the votes, rather than the usual 50%+1). Since 1991, Montenegrin politics have been dominated by the figure of Milo Đukanović, who has served as both Prime Minister and President, most recently as Prime Minister between 2008 and 2010. In 1989, as part of the “anti-bureaucratic revolution” in Serbia, Đukanović was one of three young communist apparatchiks (closely allied to Slobodan Milošević) who toppled the old guard and seized control of the local communist branch. Đukanović became Prime Minister in 1991, a close ally of President Momir Bulatović and Milošević. The Montenegrin leadership actively supported Serbia during the Balkan wars and partook in the armed conflict in Croatia alongside Milošević’s forces. Under Đukanović and Bulatović, the local communist party became the Democratic Party of Socialists (DPS). By 2001-2002, Đukanović started openly pushing for independence. The country had been an independent kingdom until it was forcibly annexed by the new Kingdom of Yugoslavia in 1918. Montenegrin national identity and its status as an ethnic group and language separate from Serbian is a touchy topic, a lot of Serbs considered Montenegrins as ethnic Serbs. Đukanović resigned the presidency to become Prime Minister again in 2002. His pro-independence coalition won the 2002 legislative elections over the anti-independence moderate coalition, led by the SNS (Bulatović lost the party’s leadership in 2001 following Milošević’s ouster, and formed his own party). As Prime Minister, Đukanović emerged as a forceful advocate of Montenegrin independence, which was finally achieved in May 2006. He resigned as Prime Minister in November 2006, and was succeeded by Željko Šturanović. Two months before, Đukanović’s coalition emerged victorious in the first legislative elections after independence. Šturanović stepped down in 2008, ushering in Đukanović’s return to the office of Prime Minister. His government was handily reelected in 2009, winning over 50% of the vote. Đukanović has emerged as a strong proponent of European integration, and his government’s policies have largely revolved around EU membership. Montenegro became a candidate country in December 2010, and negotiations with the EU began earlier this year. After the country became a candidate for EU membership, he stepped down as Prime Minister and was replaced by his close ally, finance minister Igor Lukšić. The opposition to the DPS (and its smaller sidekick/ally, the SDP) is fairly heterogeneous. The bulk of the opposition are pro-Serbian parties which opposed independence in 2006 and find their strongest support with the country’s Serbian minority (a bit less than 30% of the population). A bunch of these parties merged in 2009 under the label “New Serb Democracy” (NOVA), led by Andrija Mandić – the former leader of the right-wing Serbian People’s Party. In 2009, the SNP, now led by Srđan Milić and leading a pro-European line, was the strongest of the opposition parties. The SNP had opposed independence in 2006. Ahead of this year’s election, NOVA joined forces with the liberal Movement for Changes (PZP), a “Montenegrin” (by that, I mean that it finds most support with Montenegrins rather than Serbs) party. The PZP, which strongly supports European integration and campaigns against corruption (Đukanović and his government are often suspected of corruption, Đukanović himself was allegedly involved in tobacco smugling in the 1990s), won 6% in 2009. The two parties formed a coalition known as the Democratic Front. There was also a new party contesting, the centre-left Positive Montenegro; while the new rules on minority seats allowed small ethnic parties (for example, the Bosniak Party) which had been allied to the DPS in 2009 to run on their own. The governing coalition was easily reelected, though by a reduced margin. There is now some question over whether or not Milo Đukanović, the grand old man of Montenegrin politics who has remained as the DPS leader, will become Prime Minister again (or if he will run for President next year). After all, even out of office he has remained the real strongman in the country, and he was the top candidate on his coalition’s list again this year. The opposition came out strengthened from the election. The new Democratic Front alliance has easily beaten out Srđan Milić’s SNP to become the strongest opposition party. The SNP had been invited to join the new opposition coalition, but Milić refused. However, some members of the SNP apparently backed the new opposition coalition anyway. The DPS now falls just short of an absolute majority. It is likely that it will be able to form a government with the support of the Bosniak Party and some of the other smaller minority parties out there. A really random note on the elections in the Azores on October 14. They were uneventful, the governing Socialists (PS) retained an absolute majority in the regional legislature, the centre-right PSD (in power in Lisbon) gained some ground while the right-wing CDS-PP and the left (BE and CDU) lost ground. 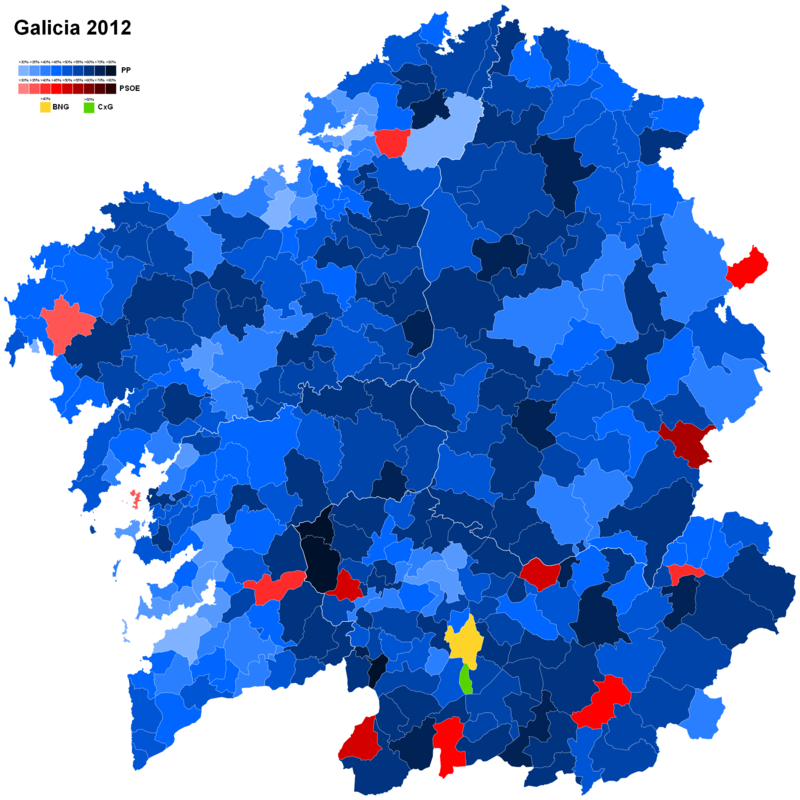 Next elections are the Basque Country and Galicia on October 21. Unfortunately, I won’t have a post up on that for quite some time until after the elections. Regional elections and the first round of senatorial elections were held in the Czech Republic on October 12-13, 2012. The Czech Republic is divided into thirteen regions in addition to Prague. These regions (kraje) were created in 2000 as second-level administrative divisions to replace the old 73 districts. Each region has a regional legislature elected directly through PR with a 5% thresholds, these legislatures in turn elect a regional president. Since their creation in 2000, there have been efforts at devolution to these regional governments, envisioned as better able to handle local government responsibilities than small municipalities. While it has been said that these regions have a great array of powers at their disposal, they have not used them much and regional government remains pretty weak. Voters, furthermore, have not identified much with these new regions, they preferred the old districts. The Czech Senate, meanwhile, has 81 members elected by thirds every two years for six year terms. They are elected in single-member constituencies through the two round system. The Senate is a toothless body, which can delay laws passed by the lower house but its veto may be overridden by the lower house with only an absolute majority. Because of its redundancy and weak powers, there have been many calls to abolish the Senate. As a result of the 2008 and 2010 renewals, the opposition social democrats (ČSSD) now have a narrow absolute majority in the Senate. The last general election, held in 2010, resulted in a centre-right government led by Prime Minister Petr Nečas (ODS). He leads a coalition including the ODS, traditionally the major right-wing party in the country and the newer right-wing and more pro-European TOP09 led by Karel Schwarzenberg. Until April 2012, the anti-corruption gadfly Public Affairs (VV) party led by former TV journalist Radek John participated in the coalition, until the party was forced out because of disagreements with the government’s austerity policies. VV, which had broken through in the 2010 general election, collapsed almost as quickly as it had emerged. Like most of these populistic “anti-corruption” outfits, VV wasn’t too clean either: one of its cabinet ministers was accused of taking a bribe. In April 2012, VV was kicked out due to disagreements with the austerity policies, but a split occured when some deputies – led by another cabinet minister, Karolína Peake – wanted to stay in the coalition and formed their own party, LIDEM. VV’s expulsion means that the cabinet is now only a minority government. Since 2010, the Nečas cabinet has implemented stringent austerity measures, including cutting investment, public spending and raising taxes. The country’s economy shrank by 4.7% in 2009, and it may have be in a double-dip recession now: GDP is projected to shrink by 1% in 2012, down from +1.7% last year. However, the country’s deficit has been getting smaller: 3.2% of the GDP in 2011, down from 5.8% of the GDP in 2009. The cabinet is dead-set on getting the deficit below the EU’s 3% limit, it has recently introduced a bill to raise the VAT by 1% and raise taxes for high earners. These policies have largely been unpopular with voters. But voters are also angry over corruption scandals, which have also touched the inept opposition (ČSSD, social democrats). A prominent ČSSD old-timer (a former minister and current regional president of Central Bohemia), David Rath, got canned for taking bribes and kickbacks. In the first round of senatorial elections, no candidate was elected by the first round. 23 ČSSD candidates qualified for the runoff, as did 12 KSČM candidates, 10 ODS candidates, 2 KDU-ČSL candidates, 2 STAN (TOP09 allies) candidates, 1 Pirate, 1 Green and 3 others (2 indies, 1 Ostrava local party). In terms of first place showings, the ČSSD placed first in 11 of the 27 constituencies, the ODS placed first in 5, the KSČM in 4, the KDU-ČSL in two, the Greens in one, the Pirates in one and all three other candidates also placed first. On these numbers, the ODS has already lost seven of the seats that it had won in 2006 (that year, it won 14 to the ČSSD’s 6) – which means that the party, at most, will hold only 18 seats in the Senate (down from 25) after this election. The KDU-ČSL will also hold fewer seats, it has failed to qualify for the runoffs in two seats they currently hold, meaning that, at most, they will hold four seats in the Senate (down from 6). The results are a major defeat for the governing parties. The 2008 regional elections, which had been held under similar political circumstances (a ODS government) were a landslide victory for the opposition ČSSD. This year, however, the ODS’ results were even worse, winning only 12.3% of the vote. Such a drubbing was not too surprising, the ODS had been expected to lose badly at the polls. The Prime Minister tried to downplay the results, noting that voters usually express discontent with the central government during regional elections. He has nonetheless pledged to continue deficit cuts, remaining set on bringing it down the EU’s 3% limit. As results of various “midterm” elections in the Czech Republic (most notably the last few regional elections) show, these kind of midterm elections do indeed often produce rather bad results for the party in power. However, that explanation may only go so far. The ODS’ mauling (and that of the government in general, with 6.6% it is not like TOP09 did too great either) is not only midterm protest voting, it is also discontent with the austerity policies, the bad economic conditions in the country and the stench of corruption which permeates both the ODS and the ČSSD. 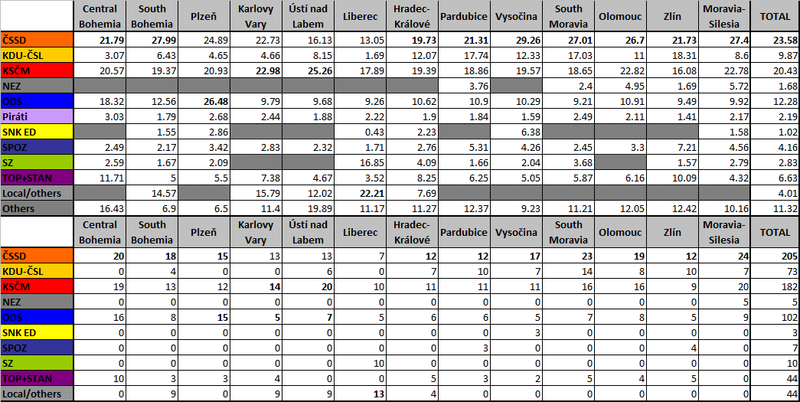 The ODS did top the poll in one region, Plzeň, but Nečas cannot even take solace in that result. In that region, the ODS list was headed by Jiří Pospíšil, a young former justice minister who was fired by Nečas in June 2012. Officially, he was removed from cabinet for opposing the austerity measures. In reality, Pospíšil’s attempts to fight corruption effectively likely rattled a few feathers. The government is currently facing a backbench rebellion over its new tax plan which would increase the sales tax by 1% and raise taxes on high earners. With an uncertain parliamentary majority, some right-wing backbenchers are threatening to bring down the government on this matter of confidence as soon as next week (October 23). They would need three-fifths of the lower house to force snap elections, which the ČSSD are calling for. The election results will boost the standing of the rebels and put even more pressure on Nečas. The rebels had already received a major boost when President Václav Klaus criticized the tax pan. The ODS would likely lose badly if a general election were held, but not as badly as in these elections. Turnout was very low in these elections, especially on the right. In a general election, turnout would be above 60% and the centre-right coalition would perform slightly better, but would still enter as the heavy underdog against the ČSSD (and no, being an underdog isn’t necessarily something to be happy about). The ČSSD emerged as the largest party in these elections, but the party’s results are rather disastrous, especially after the landslide victory it had won in the last regional elections in 2008. Corruption scandals have significantly weakened the party’s standing in public opinion. The ČSSD still topped the poll in nine of the 13 regions, and the senate elections will likely allow them to expand their large (but fairly useless) majority in the upper house. This means that, on the left and overall, the main winner of these elections are the Communists (KSČM). The KSČM is a controversial party in Czech politics, because it is one of the few (the only?) unreformed communist parties in eastern Europe to still enjoy significant popular support, mostly from a core of devoted activists and voters who turned out heavily in these regional elections. The KSČM has been shunned by the other parties, with the ČSSD expressly refusing to collaborate with them at the national level. 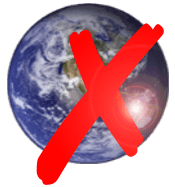 This has meant that the KSČM has remained in opposition, vitam aeternam, being able to freely oppose any policies without being held responsible itself. Much has been made of the KSČM’s result this year, and it is true that it did impressively well. However, it isn’t the party’s first spectacular result in midterm elections of this type. It has never won over 18% of the vote in general elections, but in the 2000 regional elections it won 21.2% and in the 2004 European elections it won 20.3%. The 2000 regionals were held two years after the 1998 elections, in which the ODS agreed to support a ČSSD minority cabinet in exchange for a portion of power. This agreement is remembered as the moment when the two major parties began “cooperating in unfair practices” (cite). In 2004, the ČSSD government was extremely unpopular. The KSČM’s successes in 2000, 2004 and again this year are not emblematic of a revolutionary fervour or a fundamental shift to the far-left, but rather the result of the KSČM raking up protest votes, dissatisfied at the economic situation, rampant corruption in both major parties and the rather thin policy differences between the ODS and ČSSD. With the economic crisis and major discontent at the traditional order of things (politically, but also economically), the KSČM’s vague message of egalitarianism and more jobs struck a chord with many voters. The Communists have topped the poll in two regions, Karlovy Vary and Ústí nad Labem – both in northern Bohemia, an industrial and mining heartland which has been the KSČM’s main stronghold in the past. Some have expressed satisfaction at the prospect of the KSČM governing two regions, it will give them a chance to prove themselves and will force them to take up actual responsibilities. The KSČM’s success has had its influence on the ČSSD, whose leader Bohuslav Sobotka has publicly said that he would be open to a ČSSD minority government backed by the KSČM. This is a major change in policy for the ČSSD at the national level. In the past, the virulently anti-communist ČSSD has been hostile to any national government even backed by the Communists (although there has been cooperation at a regional level). As is the case with Czech regional and local elections, in some regions local and regional parties performed well – though in some cases even better than usual. In Liberec region, the Mayors for Liberec Region (SLK – it seems vaguely right of centre and sometimes allied with TOP09), topped the poll with 22% and 13 seats. In that same region, another local party – allied with the Greens it seems – “Change for Liberec” – won 16.9% and 10 seats. In Ústí nad Labem (North Bohemia), the vaguely regionalist Severočeši.cz (NorthBohemians.cz) – a party with two senators from 2010 – won 12% and 9 seats. Local parties also won seats in South Bohemia, Karlovy Vary (in this case, two local parties won seats) and in Hradec-Králové. The second round of the senate elections will probably confirm the first round. These elections will have a major impact on the embattled Czech government, which could collapse as early as next week if the backbench ODS rebels are successful. Even if Nečas seeks to downplay these results as the product of cyclical midterm disappointment with incumbents, these elections will have severely weakened him and his government. A snap election is not yet a certainty, even if the cabinet collapses, as it requires a three-fifths majority in the lower house to call a snap election. However, the results of this election will increase the pressure on Nečas, run up the internal tension in the ODS and might lead the ODS’ partners to reconsider their participation- for example, TOP09’s leader Karel Schwarzenberg has said that the government’s economic measures should be reevaluated as to mitigate their social impact. All these factors mean that the government will probably not survive until 2014, and that an early election will come sooner than later. In these elections, the ODS risks a debacle, but the ČSSD is only in a marginally better position overall. Updated October 27: In the second round of senatorial elections on October 19 and 20, the ČSSD increased its absolute majority in the Senate. With 48 seats, it now holds nearly three-fifths of the seats on its own. The ODS lost ten seats, leaving it with only 15 seats in the upper house. The two-round system once again worked against the KSČM, despite qualifying for runoffs in 12 constituencies, they won (rather, held) only a single seat (constituency 5 – Chomutov). The most important result in these elections was probably turnout – or the lack thereof. Only 18.6% of voters turned up to the polls in the 27 constituencies up for grabs, down massively from 34.9% in the first round. Turnout was down across the board. The first round of municipal elections were held in Brazil on October 7, 2012 with a runoff to be held on October 28, 2012. Mayors, deputy mayors and local councillors in all 5,568 municipalities in Brazil. Runoffs are held in direct mayoral elections where no candidate has won 50%+1 of the votes, but runoffs are only held in municipalities with over 200,000 voters. Municipal city councils (câmaras municipais) are elected through an open list system similar to that use for elections to the federal Chamber of Deputies. Municipal elections in Brazil are the country’s “midterm elections”, they are the only elections held in between presidential elections and they are held halfway in the President’s four-year term. While on the surface the sheer amount of parties, contradictory coalitions from city to city and the vast array of personalities make the water fairly murky, and it is true that these elections are very personalized and that local political machines play a large role. However, these “midterm” local elections are nonetheless marked by complex political calculations which are tied to national and state politics. Their results have major repercussions on national and state politics, for example playing a role in boosting (or weakening) the standings of potential presidential candidates and informing the ever changing game of Brazilian coalition politics at the federal level. It has been two years since Dilma Rousseff was elected President in 2010, riding the popularity of her predecessor and mentor, Lula. A year and nine months down the road, Dilma maintains very strong approval ratings (with less than 10% judging her performance to be downright bad, and nearly 60% judging it to be excellent or good). Economic growth remains fairly strong, but slowed down to 2.7% in 2011 and is projected to grow by only 1.5% this year. Slower economic growth has forced the government to be surprisingly defiant to the demands of federal government employees, including teachers and federal police, who had been on strike since earlier this year demanding higher salary increases (they were granted an inflation-only offer of 15.8% over three years). This is surprising coming from a party, the PT, whose roots lay in the unions, but Dilma has continued to move the PT away from its historical socialist roots towards third-way politics. She has favoured private sector growth and promised to reduce the high cost of doing business in Brazil, for example by extending payroll-tax cuts to more industries or cutting the very high electricity tariffs in the country. While Dilma and the PT remain instinctively hostile to privatization, she has made it clear that she supports more private investment in infrastructure. The government has already auctioned off contracts to run three airports, and it plans to auction road and railway concessions to the private sector to invite investors to build, upgrade and operate toll roads and railways. The entire Brazilian political class has been rocked by some major corruption cases in recent months, most significantly the big Cachoeira scandal (Carlinhos Cachoeira is a businessman behind a big gambling racket, currently investigated for money laundering and running an illegal gambling network), which has implicated a number of senators, federal deputies and two governors. The impact of the Cachoeira scandal has been felt across party lines, but it has mainly hurt the opposition: a prominent opposition senator, Demóstenes Torres (DEM-GO), is one of the major politicians cited in the case, as is the embattled PSDB governor of Goiás, Marconi Perillo. However, corruption cases have not left the government unscathed. Dilma’s cabinet has had lots of turnover in recent months, as she was forced to fire one cabinet minister after another as they got knee-deep into various cases of corruption, graft, influence-peddling, bribery or misuse of public funds. Some of those cabinet ministers, such as her former Chief of Staff Antonio Palocci (PT-SP), had been close allies of her predecessor and mentor, Lula. Others had been members of her venal allies, who have discovered the political (and financial) value of getting their own ministries. With various corruption cases, she lost her transportation minister Alfredo Nascimento (PR-AM), the agriculture minister Wagner Rossi (PMDB-SP), tourism minister Pedro Novais (PMDB-MA), sports minister Orlando Silva (PCdoB-BA), labour minister Carlos Lupi (PDT-RJ) and cities minister Mário Negromonte (PP-BA). Dilma’s tough stance against corrupt ministers in her entourage has allowed her to score points with public opinion, and it has allowed her to slowly but surely lay her personal mark on the government and differentiate it from Lula. However, the PT is likely worried about what effects the current Supreme Court case surrounding the old mensalão scandal from 2005 (when the PT bribed congressional partners for their votes) could have on them. It apparently tried to push back the case until after the local elections; it came out that Lula had tried to blackmail a judge – Gilmar Mendes – by threatening to reveal Mendes’ links to the Cachoeira scheme. Just a few days ago, the court found Lula’s former Chief of Staff José Dirceu and former PT president José Genoino guilty on counts of bribery in the mensalão, though their sentences will not come down until later. This landmark case, among others, will at least contribute to breaking the culture of impunity which has permeated the Brazilian political elite for so long. It is unlikely to hurt or help any particular party; no major Brazilian party has a clean record, and voters recognize this. Brazilian party and coalition politics is very complex business. Party loyalty is very weak, what matters are personalities and their individual ambitions. Nonetheless, even if most parties are venal self-interested actors with no ideologies, a few parties are major players in their own right. The Party of the Brazilian Democratic Movement (PMDB), the ultimate big tent party which seeks only to maximize its power, is a key ally of the Dilma government but some local and state bigwigs are showing their discontent with the federal government and their coalition with the PT. Another smaller venal ally of the government, the Republic Party (PR) broke away from the government shortly after Nascimento was dumped and joined the ranks of the opposition. The Brazilian Socialist Party (PSB), led by the very popular and ambitious governor of Pernambuco Eduardo Campos, is quite tired of being the second fiddle to the PT and is slowly drifting away from the PT and turning into more of a traditional big tent, ideologically diverse or undefined party. Eduardo Campos is a potential candidate for President in 2014 or 2018. The opposition is also being moved around. The traditional party of the centre-right, the PSDB, risks losing even more feathers as it continues to be unable to renew itself and move past its old leadership disputes. However, its main ally, the Democrats (the former PFL, the remnants of the conservative pork-barreling party of the old military dictatorship), are collapsing even more rapidly. The big news in Brazilian politics in 2011 was the maverick DEM mayor of São Paulo, Gilberto Kassab, splitting off to form his own party, the Social Democratic Party (PSD), which positions itself slightly to the left of the DEMs, closer to the centre and to the Dilma government (while not being a ‘government party’). The PSD has attracted a good number of defectors from the DEMs (but also other parties) and it has grown to 47 federal deputies, much more than the DEMs (left with 28). These defections have left the Democrats virtually on life support. The table below gives the number of mayors elected by party in the first round, compared to the 2008 municipal elections (first round); as well as the number of councillors. The results did not indicate any major changes, besides a strengthening of the PT and the success of both the PSD and the PSB. The PT’s gains seem heaviest in small and medium-sized towns, with the clear influence of some strong state governments (notably Bahia) helping the PT to create a strong base at the municipal level. The results of the other parties reveal the importance of state governments as well; the PSD was rather strong in Santa Catarina because of governor Raimundo Colombo (former DEM, now PSD), the PSDB performed well in its historical base of São Paulo but also Minas Gerais, Paraná or Pará where they control the governorship and the PSB clearly dominates in Pernambuco and is in a strong position in the Northeast as a whole (notably Piauí, where it now controls the state government). The Democrats were obliterated, the creation of the PSD sorely hurt them in Santa Catarina, Bahia but also Minas Gerais and São Paulo. At it currently stands, the DEMs are basically on life support and their continued existence as an independent political party is called into question. Would they be better off merging with the PSDB to create larger centre-right opposition party? The PMDB, by and large, remained predominant in a lot of towns throughout the country and by coalitions and alliances it will probably partake in the governance of over half – if not more – of Brazilian municipalities. The loss of state government in Paraná and its disaffiliation with the PT machine in Bahia resulted in significant loses for the party in those states, but it made major gains in São Paulo. São Paulo, Brazil’s largest city and economic capital, is the big prize in all municipal elections – especially this year. Being mayor of São Paulo has often been a trampoline to seek higher office, such as the state’s governorship or the presidency. Politically, as a predominantly white and middle-class business city, São Paulo has leaned to the right – centre-right opposition candidate José Serra won 54% in São Paulo in the 2010 runoff against Dilma. The incumbent mayor of São Paulo since 2006 is Gilberto Kassab (PSD, ex-DEM). Kassab is retiring this year, but there are rumours that he is eyeing a run for governor in 2014 – even though governor Alckmin (PSDB) is quite popular. The first mayor directly elected after the restoration of direct elections and multiparty democracy was none other than former President Jânio Quadros (who served as president a few months in 1961 before suddenly resigning, probably on a drunken fit), a literally insane populist clown figure. In that 1985 election, Quadros defeated Fernando Henrique Cardoso, a prominent academic who would later become President, after a campaign during which Quadros described FHC as a “pot-smoking atheist” and alleged that Cardoso would force the inclusion of marijuana into school lunches. Following Quadros’ uneventful term, he was succeeded by Luiza Erudina of the PT – the PT had been founded in the city’s industrial hinterland (the ABC cities). She was succeeded in 1992 by former military-era appointed mayor and later governor Paulo Maluf, a corrupt conservative populist and one of Brazil’s most controversial political figures (he is currently on Interpol’s wanted list, for money-laundering and other accusations in the US). His right-hand man Celso Pitta replaced him in 1996. Seeking to return to office in 2000, Maluf was defeated by the PT’s Marta Suplicy in the runoff with over 58% for Suplicy. However, she was defeated in her reelection bid by PSDB candidate José Serra (the 2002 PSDB presidential candidate and former health minister), who won 55% in the runoff. Serra stepped down in 2006 in order to run for governor that same year, he was succeeded by his deputy mayor, Gilberto Kassab, who won a full term in his own right in 2008 with over 60% of the vote. This year, Kassab leaves office with mediocre approval ratings. The PSDB candidate this year was José Serra – former mayor, governor and unsuccessful presidential candidate in 2002 and 2010. Serra had originally said that he would not run, but a few months later he backtracked on his statement and won a PSDB primary against two rivals, including an ally of the state governor, Geraldo Alckmin. Serra would like to run for president for a third time in 2014, but few in his party are keen on that terrible idea, first and foremost governor Alckmin and Senator Aécio Neves, the current PSDB favourite for 2014. Serra, however, can still count on the strong backing of his friend and ally Kassab, and his party (the PSD). The PT has a long history in the state and city of São Paulo but has had limited success at both the state and municipal level in recent years. The field of potential PT candidates included former mayor and current senator Marta Suplicy, her ex-husband senator Eduardo Suplicy, science minister Aloizio Mercadante and education minister Fernando Haddad. Since 2011, former President Lula has become the de facto leader of the party and its top power broker. While there have been no public disagreements between Lula and his protégé, Dilma, some have wondered if Lula could run for president again in 2014. In São Paulo, fully utilizing his power at the unofficial party boss, Lula moved to sideline Marta Suplicy and others in favour of education minister Fernando Haddad, who he felt could have a stronger appeal to middle-class voters (unlike Suplicy, whose base lies with poorer voters in the city’s outskirts). Haddad was very much promoted as Lula’s candidate, and Dilma publicly campaigned for him only very late in the campaign. Haddad’s candidacy ran into problems when Interpol Most Wanted (and former mayor) Paulo Maluf and his party (the PP) endorsed Haddad. This embarrassing alliance with the arch-corrupt party boss led Haddad’s original ‘running mate’, former mayor Luiza Erudina (now affiliated with the PSB) to step down. However, the frontrunner during a good part of the campaign – and especially for the final stretch – was Celso Russomano, a former federal deputy and popular consumers advocate. Russomano is now a member of the small Brazilian Republican Party (PRB), a non-ideological party closely linked to the evangelical United Church of the Kingdom of God (UCKG). Russomano ran a populist campaign, especially popular with poorer, traditionally petista voters but also middle-class voters tired of the PSDB/PT back and forths in the city. He took the lead from Serra in late August and led by a solid margin until the end of September, when an onslaught from Serra and Haddad brought him back down. The last polls showed a three way tie. Serra’s candidacy was dogged by how he had ended his first stint as mayor: after being elected by saying that he would serve out the full four years, he quit 15 months in to run for governor. There is that underlying ‘fear’ that he might run for something else if he won. Other candidates included Gabriel Chalita (PMDB), an ally of governor Alckmin and a close Serra ally, Soninha (PPS), who ran a social liberal campaign. A map of the results is available here. The results of the first round were very surprising, with Serra and Haddad both doing well (especially Haddad) and qualifying for the runoff while Russomano placed a paltry distant third with only 22%. There was a really last minute shift away from Russomano, due to a variety of factors including revelation of personal scandals and questions about his links to the UCKG. The last polls had shown that he had been shedding support from traditionally petista lower-income voters but also middle-class voters, the bleeding continued into election day. The map shows that Russomano got the bulk of his support in the lower-income/working-class peripheral neighborhoods on the outskirts of the city, where the PT is strongest, though he did do fairly well in some more middle-class areas in the north of the city where the PT is weaker. Fernando Haddad’s remarkable result is a success for his top backer, Lula. He started out running at 3% in the polls (like Dilma in 2009/early 2010) but has ended up qualifying for the runoff. In the runoff, furthermore, he is the favourite. Two polls have already shown him up by 10 over Serra, and he has the backing of Gabriel Chalita (even if the SP PMDB is right-wing, Chalita dislikes Serra) and will probably win most of Russomano’s voters. Serra has high negative ratings, and he is a poor candidate. He is more and more a tired politician who doesn’t seem to understand when to stop. He will try to use the mensalão scandal and some anti-homophobia school kit against Haddad, but for the moment it looks as if the PT could win an historic victory in the city. Rio, Brazil’s other big city and host of the 2016 Olympics, did not have a very contested race this year. In 2008, the PMDB’s Eduardo Paes had won a very narrow victory against the Green Party’s Fernando Gabeira, replacing term-limited DEM incumbent Cesar Maia (who served as mayor between 1993 and 1997 and 2001 and 2009). Paes has been a very popular mayor, in part due to the 2016 Olympics and 2014 FIFA World Cup, which has boosted investment and economic development in the city. He ran for reelection, benefiting from the backing of the PT. His two main opponents were state deputy Marcelo Freixo (PSOL), a prominent opponent of the drug cartels and federal deputy Rodrigo Maia (DEM), the son of Cesar Maia (who failed to win a senate seat in 2010 and was running for city council this year). A map of the results is available here. Paes won reelection by the first round in a landslide, and while Freixo did relatively decently, Rodrigo Maia (and what he represented as the scion of a prominent local political dynasty) was utterly humiliated. The map is fairly interesting, especially in relation to Marcelo Freixo’s support. Freixo is a state deputy for the small far-left PSOL, formed by PT dissidents during Lula’s first term, and he has built his political career on a courageous crusade against the powerful drug cartels which remain powerful in many favelas in the city. Ironically, however, Freixo received his strongest support in the city’s upper middle-class coastal and central neighborhoods (Botafogo but also the emblematic Copacabana, Ipanema, Leblon, Gávea), usually right-leaning areas. His crusade against the drug cartels has made him the favourite of a good part of the city’s upper middle-classes, but did poorly in the lower-income northern neighborhoods. In Belo Horizonte (Minas Gerais), the incumbent PSB mayor Márcio Lacerda, elected in 2008 with left-wing support, was reelected this year with right-wing support (the PSDB, DEMs and PSD notably). He won 52.69% against 40.8% for former cabinet minister Patrus Ananias (PT). Lacerda has always been a close ally of PSDB senator Aécio Neves, the former governor (until 2010) and likely presidential candidate in 2014. Hence, Lacerda’s victory is a major boost for Aécio’s presidential ambitions but is also good news for another potential 2014 candidate, governor Eduardo Campos (PSB-PE). In Salvador (Bahia), the fight to replace term-limited unpopular incumbent João Henrique (PP) is going to be very close between federal deputy ACM Neto (DEM) and Nelson Pelegrino (PT). ACM Neto, who is the grandson of the late Antonio Carlos Magalhães, a prominent conservative baron in Bahia, won 40.17% against 39.73% for Pelegrino. Former mayor Mário Kertész (PMDB) won 9.43% and Márcio Marinho (PRB) took 6.51%, and both candidates have endorsed Pelegrino (although some sections of the PMDB are backing ACM Neto). These results are fairly mediocre, in my eyes, for the PT, but its support has likely been hurt by the state government’s (led by PT governor Jaques Wagner) fight against two public sector strikes. The runoff will be closely fought, but Pelegrino probably has a tiny edge. In Recife (Pernambuco), incumbent mayor João da Costa (PT) was retiring (pressured into doing so), leaving the field wide open for the very popular state governor, Eduardo Campos (PSB) to anoint his candidate. He did so, in the form of little-known Geraldo Júlio (PSB, allied, amusingly, with the PMDB). Geraldo Júlio started out with 5% in July, but the support from the governor and the state government propelled him into the lead, ahead of Senator Humberto Costa (PT) and former governor Mendonça Filho (DEM). Júlio won 51.15%, against 27.65% for Daniel Coelho (PSDB) ans 17.43% for Humberto Costa (PT). In yet another blow to the influence of the formerly dominant Democrats/PFL, Mendonça Filho took only 2.25% of the vote. Júlio’s landslide is a major victory for Campos, an ambitious politician with his eyes on the presidency in 2014 or 2018. Curitiba (Paraná) was quite interesting, and surprising. Mayor Beto Richa (PSDB) stepped down in 2010 to run for governor (he won), leaving Luciano Ducci (PSB – the local PSB is right-wing) in the mayor’s chair. Ducci, backed by the centre-right, was running for reelection, and seemed in a decent position to at least qualify for the second round. However, with 26.77%, he placed only a close third in the first round and is out of the runoff. The runoff will oppose Ratinho Jr. (PSC), the son of a popular talk show host and TV personality, who took 34.09% on a populist independent platform, and Gustavo Fruet (PDT), backed by the PT (Fruet had run for senate for the PSDB in 2010 but lost narrowly) who took 27.22%. Ratinho Jr is probably the favourite in the runoff. Mayor Ducci’s defeat is a major blow for the state governor, Beto Richa, who is nonetheless fairly popular, and Eduardo Campos. In Porto Alegre (Rio Grande do Sul), incumbent mayor José Fortunati (PDT, centre-right) won reelection with 65.22% against 17.76% for federal deputy Manuela d’Ávila (PCdoB) and 9.64% for Adão Villaverde (PT). Fortunati showed some signs of vulnerability earlier on, but through a shrewd campaign he strengthened his appeal to a large number of voters. Manuela, a prominent federal deputy and former student leader, was the de facto candidate of the left, given that Villaverde got only limited support from the national PT. In Manaus (Amazonas), where mayor Amazonino Mendes (PDT) is retiring, the leader coming out of the first round is former senator Arthur Virgílio Neto (PSDB), who was defeated for reelection to the Senate in 2010. Surprisingly, he came out far ahead of the pack in the first round with 40.55% against 19.95% for Senator Vanessa Grazziotin (PCdoB), backed by the PT and the PMDB. Henrique Oliveira (PR) placed third with 16.46%, while former mayor Serafim Corrêa (PSB) won 11.64%. Sabino Castelo Branco (PTB), a federal deputy and popular TV personality, won 7.3%. Grazziotin having been expected to have been stronger in the first round, the value of runoff polls which showed her narrowly ahead of Arthur Neto seem a bit off. However, it seems as if Dilma will campaign for her and that the PT is putting some attention into this race. In Fortaleza (Ceará), incumbent mayor Luizianne Lins (PT) is term-limited. After the first round, Elmano de Freitas (PT), backed by the outgoing mayor, has 25.44% against 23.32% for the president of the state legislature, Roberto Cláudio (PSB), a close ally of governor Cid Gomes (PSB) and his brother Ciro Gomes (PSB). Heitor Ferrer (PDT), a state deputy, won 20.97% and former federal deputy Moroni Torgan (DEM) took a paltry 13.75%. The PSOL candidate somehow won 11.84%. In Belém (Pará), incumbent mayor Duciomar Costa (PTB) is term-limited. This is another city where the runoff remains up in the air, after a close first round. Popular state deputy and former mayor Edmilson Rodrigues (PSOL) won 32.58% but federal deputy Zenaldo Countinho (PSDB) was close on his heels with 30.67% after receiving a late endorsement from governor Simão Jatene (PSDB). Jefferson Lima (PP), a radio personality, took 12.89% and federal deputy José Priante (PMDB) won 8.79%. The PT, whose candidate won 3.06%, is backing Edmilson. The PSOL, pushed by the candidacy of former senator Marinor Brito, also managed 4 seats on city council. In Cuiabá (Mato Grosso), the very unpopular incumbent Chico Galindo (PTB) is retiring. Mauro Mendes (PSB), backed by “soy king” senator Blairo Maggi (PR) and senator Pedro Tasques (PDT), took 43.96% against 42.27% for Lúdio (PT), backed by the incumbent PMDB governor. The PSOL won 5.42% and the PSDB candidate won 4.59%. This race looks like a tossup, but a PSB victory here would be another strong result for the party. Goiânia (Goiás) mayor Paulo Garcia (PT), in office since 2010, won a first term outright with 57.68% in the first round. Jovair Arantes (PTB), backed by the PSDB, took 14.25%. Ex-senator Demóstenes Torres (DEM-GO), before getting knee deep into the Cachoeira scandal, had indicated his intention to run for mayor here. In Natal (Rio Grande do Norte), incumbent mayor Micarla de Sousa (PV) is extremely unpopular and is not running for reelection. The favourite is former mayor Carlos Eduardo Alves (PDT), who served right before Micarla (and Micarla was his deputy mayor), who took 40.42% in the first round. Carlos Eduardo is the nephew of former mayor, governor, senator and current cabinet minister Garibaldi Alves Filho (PMDB) and the nephew of former governor Aluísio Alves; his running mate is Wilma de Faria (PSB), a former governor and mayor. The clan was disunited, because PMDB’s house leader Henrique Eduardo Alves backed Hermano Moraes (PMDB), who placed second with 23.01%. Fernando Mineiro, a longtime PT activist, took 22.63% and federal deputy Rogério Marinho (PSDB) won 10.16%. Teresina (Piauí) mayor Elmano Férrer (PTB), backed the PMDB, placed second in the first round with 33.14% against 38.77% for former mayor and state deputy Firmino Filho (PSDB). Former governor and incumbent senator Wellington Dias (PT) placed third with 14.18%, Beto Rego (PSB) won 10.69%. The mayor of São Luis (Maranhão), João Castelo (PSDB), is in a tough race for a second term. With 30.60%, he trails Edivaldo Holanda Jr. (PTC) who won 36.44%. State deputy Eliziane Gama (PPS) won 13.81% while vice-governor Washington Oliveira (PT), the candidate of the Sarney clan, won only 11.02%. In Campinas (São Paulo), Jonas Donizette (PSB, ex-PSDB), backed by the PSDB and the DEMs, is the big favourite in the state’s third largest city. He took 47.6% in the first round. The municipality has been rocked by scandals since 2011, which forced the PDT mayor and then his PT deputy to resign and left the president of the chamber, Pedro Serafim (PDT) in charge. The incumbent mayor, Pedro Serafim, was a distant third with 18.47% while economics prof Marcio Pochmann (PT) won 28.56%. In Ribeirão Preto (São Paulo), meanwhile, incumbent centrist mayor Dárcy Vera (PSD), supported by the PMDB and former cabinet minister Wagner Rossi (PMDB), is the favourite after winning 46.34% in the first round. The PSDB’s Darcy Nogueira took 30.38% while the PT, hurt by the stench of corruption surrounding former mayor Antonio Palocci won only 15.o6%. The PSD also has a strong chance in Florianópolis (Santa Catarina) where its candidate, state deputy César Souza Jr., backed by governor Raimundo Colombo (PSD) but also the PSDB and PSB, won 31.68% against 27.37% for Gean Loureiro (PMDB), the candidate backed by senator and former governor Luiz Henrique da Silveira (PMDB). The PCdoB-PT candidate won 25.03%, the PSOL took 14.42%. Senator Luiz Henrique da Silveira would also like to reconquer the state’s largest city, Joinville, the PMDB candidate placed second with 35.52% against 41.42% for the PSD. The PT and PSDB are also facing off directly in runoffs in Guarulhos (SP) where the PT is the big favourite and Rio Branco (Acre) where 2010 gubernatorial candidate Tião Bocalom (PSDB) is not far behind Marcus Alexandre (PT) with 43.9% against 48.3% for the petista backed by the Viana siblings (the PT governor and senator from the state). The results of the second round will be closely followed in a lot of these cities and a few others (for more results, O Globo has them in a text format and Veja has a map) because of the regional and national implications they will carry for the main parties, their ambitious leaders and for the state of Brazil’s notoriously complex and unstable coalitions. After the first round, two likely 2014 presidential candidates are strengthened. In Minas Gerais, Senator Aécio Neves got his candidate reelected in Belo Horizonte and the PSDB held up fairly well in his state, which would be a key swing state if Aécio is the tucano candidate. Governor Eduardo Campos (PSB-PE) was successful, especially with the phenomenal landslide for his candidate in Recife, and with his party’s strong showing in the whole of the Northeast. For now, the PSB governor of Pernambuco has reiterated that his party remains a supporter of Dilma’s government (where it has cabinet positions) and that it is too early to talk about 2014. But this election showed that the division between the PT and PSB, traditional partners for over 20 years, has grown quite deep as the PT pursues alliances for allegedly opportunistic and selfish reasons with other parties (firstly the PMDB) while the PSB is eager to mark its independence from the PT. Eduardo Campos’ candidacy is still not a certainty, as there is a chance he might prefer to wait until 2018 where there is a chance that he could be endorsed by the PT. After all, Dilma is not dead in the water – far from it – she has strong approvals and it is unlikely that Lula would directly challenge her for the PT nomination (though if he did, he would be the favourite). Her policies have carried a particularly strong appeal to middle-classes which have traditionally been cooler towards the PT, and it is not clear if discontent on her left would express itself electorally. However, 2018 could be too late for Campos and he might see 2014 as an opportunity to build up his name and image ahead of a winning run in 2018, similar to what Ciro Gomes had tried to do in 1998 and 2002. On top of that, there are now rumours of a sort of “super-ticket” between Campos and Aécio for 2014, an idea which has been endorsed by FHC. I hope that this post provided some interesting information and details about Brazil’s complex local politics to those interested. 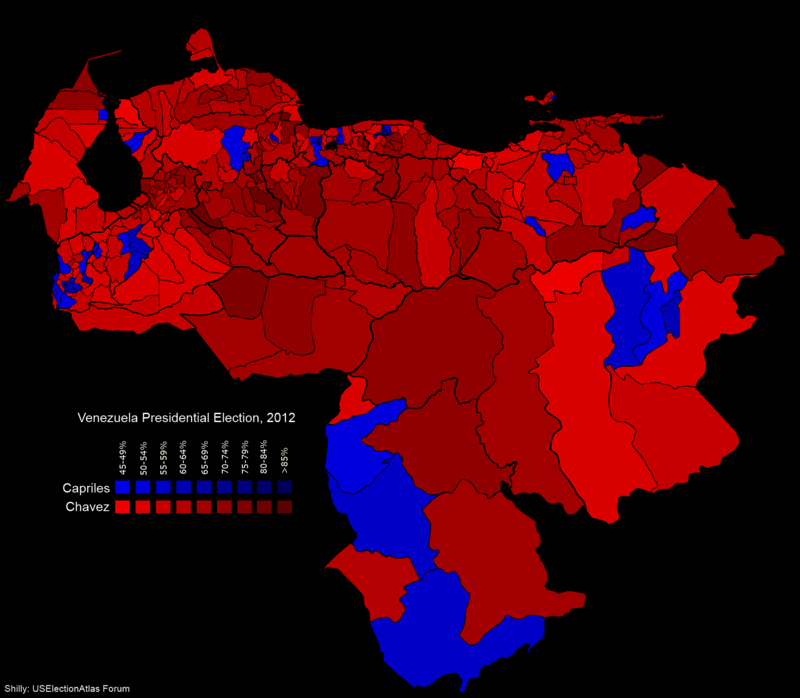 Presidential elections were held in Venezuela on October 7, 2012. The President of Venezuela is now elected for a six-year term with no term limits. Venezuelan politics since 1998 have revolved around the figure of President Hugo Chávez, a controversial love-or-hate figure who has left few Venezuelans and indeed many foreigners indifferent. Chávez is a former military officer, born in a lower middle-class mestizo family in a rural region of Venezuela known as los llanos. He gained national prominence in 1992, when he was the leader of an unsuccessful coup attempt against then-President Carlos Andrés Pérez. Released from prison in 1994, he used his grassroots popularity with the country’s disillusioned and socially marginalized impoverished masses to win the presidency in the 1998 election. He was reelected under a new constitution in 2000 and once again in 2006. He survived a 2002 coup attempt and a 2004 recall referendum initiated by the opposition. Chávez is an extremely polarizing figure. His opponents argue that he is a populist autocrat who has eroded democratic institutions, stifled opposition and centralized political and economic power in his hands. His supporters view him as the hero of Venezuela’s poor, behind dramatic improvements in their standard of living and a major decline in social inequality and poverty. They admire him for standing up to “imperialist” elites who had controlled Latin America for far too long, and brand the opposition as a ragtag band of privileged selfish elites in bed with the “neoliberal” financial elites embodied by the IMF or the World Bank. However, this model collapsed in the 1980s with the major fall in the price of oil which drained the country of its main source of revenue. It hardly helped, moreover, that previous oil profits had been woefully mismanaged by governments which were all too happy to spend it away. The government was forced to devalue the currency and resort to price controls, but corruption was rampant and unchecked in all echelons of power. In 1988, Carlos Andrés Pérez of the AD, who had previously served as President during the plentiful 1970s (but whose irresponsible and reckless economic policies proved disastrous and under whom corruption became ingrained), was returned to power. Pérez had campaigned on a populist and anti-“neoliberal” platform which denounced the IMF and the Washington consensus, but upon assuming power – in pure Latin American tradition – he quickly set upon doing the exact opposite of what he had promised. The poor economic outlook forced him to accept the IMF’s (in)famous structural reforms, including a liberalization of oil prices. Chávez’s main achievement during his years in office have been his social programs. He launched his first social programs, which have been styled ‘Bolivarian Missions’ by his government (always keen on utilizing revolutionary or ‘Bolivarian’ rhetoric), during his first years in office, and stepped them up during his second term. Venezuela’s oil wealth – and the rise in the price of oil throughout his presidency (with the exception of a sharp dip during the 2008 economic crisis) – have financed most of Chávez’s social programs. He can claim credit for significantly reducing poverty in Venezuela. Poverty has declined sharply from 59% of the population in 1999 to only 28% in 2008, while extreme poverty from 22% to just under 10% in the same period. The Gini index, which measures income inequality, declined during his presidency, indicating a trend towards greater income equality. Some of his government’s most famous Bolivarian Missions have included Mission Barrio Adentro, which aims to provide local healthcare to impoverished barrios; Mission Robinson, a literacy campaign and Mission Hábitat, a project to build new housing units for the poor. Some of these projects, notably Barrio Adentro, have been developed with foreign assistance and participation, notably from Cuba – Cuban doctors staff and run the local clinics which are part of the Barrio Adentro program. It is clear that these programs have been at least somewhat successful, and it would be tough to deny Chávez any credit for the decline in poverty. However, some of these programs have become mismanaged and inefficient; the opposition claims they are also corrupt and clientelistic. For example, the number of houses built by the government have fallen short of its target. The government has also struggled to achieve food sovereignty, originally one of Chávez’s key targets. The government has stuck to its policy of price controls and has set up discounted, subsidized supermarkets. However, the country remains dependent on imported foodstuffs and it continues facing chronic food shortages. Opponents have pointed to Chávez’s actions (including expropriations and nationalizations) against private food producers as a reason for these shortages. While most agree that these social programs have been successful, some critics worry that these programs are not sustainable in the long term. The government has funded its programs and other activities by borrowing, in the process piling up the debt. The country’s public debt has been increasing very rapidly, from 26% of the GDP in 2008 to over 50% in 2012 (and it is projected to keep rising quickly). Under his presidency, the size of the state has grown enormously, and a good part of the country’s oil revenues have been placed under the President’s discretion, often to fund lavish campaign promises. PDVSA has become somewhat of an all-purpose development agency under the state’s control. The main employers federation, which has long been a base of opposition strength, has said that the President’s goal is the destruction of private enterprise. This is exaggerated, because regardless of the extent of state control in the economy, the private sector has not been hollowed out entirely and it retains dominance in some sectors, such as the media – although its political activism has largely been tamed since 2002-2004. One point on which both supporters and opponents of Chávez will agree upon is that his foreign policy has placed Venezuela as a major actor on the world stage. The agreement, however stops there. Chávez, who sometimes seems to act controversial and provocative on purpose, has led a very controversial foreign policy, tied in closely to his ideology of “socialism in the 21st century.” He has made himself into one of the most prominent critics of American foreign and economic policy, and he has allied himself with other opponents or rivals of the United States including Iran, Russia, China, Cuba, Syria and Libya (until 2011). At the regional level, he has promoted Latin American integration. While Chávez’s election in 1998 was identified as the first victory in a series of electoral victories for the Latin American left in the late 20th and early 21st century, not all left-wing heads of states elected in his footsteps in the region have aligned with his model of socialism or adhered to his policy. Chile, but also Argentina and Brazil have tended to steer towards a more moderate brand of leftism, reminiscent of social democracy rather than chavismo. However, Chávez has found strong allies in Ecuador, Bolivia, Nicaragua and Cuba. Venezuela has used its oil wealth to promote its foreign policy and partake in development efforts in other countries, most significantly through the Petrocaribe program which offers Venezuelan oil to countries such as Cuba and Nicaragua at discounted prices. Chávez has received extensive criticism, both at home and abroad, for his record on human rights and democracy. There is a lot of dishonesty in these arguments, both those which seek to portray him as a tyrannical monster and those who seek to paint him as a democrat who happens to go against an established norm. He is neither of those things. However, Venezuela has been dinged by several institutions – Amnesty International, the UN, Human Rights Watch, Freedom House and Reporters Without Borders for its record on human rights, civil liberties, political freedoms and press freedom. Reports have criticized his administration’s tendency to discriminate on political grounds; erode judicial independence and undercut journalistic independence. There is no proof, however, that Chávez rigged the polls in recent elections. The 2007 (obviously!) and 2009 referendums, 2006 presidential election and 2010 legislative elections were accepted by almost all players as being free, if not entirely fair. Through tight control of the media and state institutions, Chávez has been able to create a political playing field which is biased towards him and works against the opposition. For example, the opposition and the PSUV ended up roughly tied in the popular vote in the 2010 legislative election, but the PSUV retained a comfortable majority thanks to gerrymandering. Opposition access to the media is tightly controlled and limited, while the government and Chávez have free access to the media. After Chávez’s close call in the 2010 elections, he stepped up his plan to reorganize local government institutions in the country through the creation of “socialist communes”, presenting them as a grassroots way of devolving more power to the people (and curbing the power of municipal governments, some of which are controlled by the opposition). One of Chávez’s main weaknesses in his third term has been criminality. The homicide rate in Venezuela has increased at a dizzying pace since the 1990s, making it one of the most violent countries in the world. The homicide rate increased from 25 in 1999 to 67 in 2011, and many have been critical of Chávez’s record in reducing crime, some accusing him of sliding his feet on the issue. Drug trafficking and cross border activity with Colombia seems to be one of the main causes of the recent jump in crime in the country. It would be fair to identify crime as one of the main reason for the dip(s) in Chávez’ popularity since 2006. Hugo Chávez was diagnosed with cancer in June 2011, and since then he has been in and out of the country receiving treatment and subsequent convalescence in Cuba. Few details have been leaked about his cancer or its gravity, which has allowed for a whole slew of rumours on Chávez’s actual health. By all measures, Chávez entered this fight for a fourth term in office in a more precarious position than in his past reelection campaigns. His popularity took hits under accusations of corruption and mismanagement while frustration over food shortages, housing policy, rising inflation and criminality, deteriorating infrastructure and power outages have also hurt Chávez’s popularity. However, even a fragilized and frailer Chávez remains a truly formidable campaigner, a master communicator and a talented politician. He is very charismatic, with a remarkable ability to draw huge crowds and an ability to connect with poorer Venezuelans. As in most countries where recent politics have been dominated by one man, the opposition in Venezuela has taken the form of a fractious and heterogeneous coalition of politicians and parties of all stripes who oppose Chávez. The opposition has been united under the umbrella of the Mesa de la Unidad Democrática (MUD) since 2009. The MUD is a very heterogeneous bunch, uniting centrist reformers, more liberal right-wingers, former leftist allies of Chávez and the remnants of the old decrepit parties (AD and COPEI). The main forces in the MUD are the centre-right Primero Justicia (PJ), the more centre-left Un Nuevo Tiempo (UNT) and whatever remains of the two old behemoths – AD and COPEI – which is to say, not much. It also includes some more clearly left-wing oriented parties, some of which are former Chávez allies, such as the MAS and the Radical Causa (La Causa R). The MUD held an open primary election to nominate its presidential candidate in February 2012. There were five candidates in the MUD’s primary, but the top two contenders were Henrique Capriles Radonski (HCR), the governor of the state of Miranda (in suburban Caracas) and Pablo Pérez, the governor of the state of Zulia in the far-west. The ideological differences between the two candidates were fairly thin, though Pérez – a member of the UNT party – was judged as being slightly more to the left of Capriles, more centrist and linked to PJ. Pablo Pérez was notably supported by the two old parties, AD and COPEI, something which allowed Capriles to depict himself as being outside Venezuela’s old party machine politics. The MUD primary was a phenomenal success for the opposition, attracting over 3 million voters (roughly 17% of the total electorate). Capriles won easily with 64%. Capriles proved to be a strong candidate, even up against Chávez, and certainly a much more capable opponent that Chávez’s 2006 opponent, the hapless Manuel Rosales. Capriles is charismatic, energetic and young and while his family background might indicate a middle-class upbringing and style, he was fairly successful in broadening his appeal. He crisscrossed the country, even campaigning in chavista bastions. Capriles presented himself as a “modern” social democrat, in the style of Brazil’s Lula – though unfortunately for him, Lula endorsed Chávez wholeheartedly. He vowed to maintain (and expand) Chávez’s main social programs, while targeting mismanagement, clientelism and corruption in them. Otherwise, Capriles also focused his message on some of Chávez’s core weaknesses: deteriorating infrastructure, crime or power outages. However, Capriles was very much the underdog throughout the campaign. While Venezuelan pollsters are notoriously partisan (and hence often inaccurate), most established pollsters had him trailing Chávez by some 10 points, though Capriles’ team held out hope that the high level of undecided voters and Chávez’s standing below 50% would give them a shot. The above map was drawn by Shilly, on the US Election Atlas Forum. Chávez won by 11 points, a solid margin. His victory was never really in doubt, I would say, even though some flawed pollsters with an “hidden agenda” led us to believe that Capriles was ahead of Chávez. Capriles likely had the momentum in the final stretch, though given the wide differences between each pollsters’, it is hard to quantify. However, Chávez certainly was the main benefactor of the unexpectedly high turnout. High turnout usually favours the chavistas, who have traditionally been very efficient at driving out their voters and maximizing support from their core constituencies (the poor, the working-class and the public sector) in such circumstances. It is true that Chávez was probably unfairly advantaged by his control of institutions – the opposition has often decried during this campaign his tendency to plunge into the country’s oil wealth to finance his campaign and his pre-electoral “spending sprees” – but it is clear that Chávez remains the choice of a majority of Venezuelans, and he remains a formidable candidate. Though Chávez’s margin of victory this year is much less impressive than his 20+ point squashing of the hapless Manuel Rosales in 2006, this is still a significant and comfortable victory after a six-year term which was fairly difficult. Regardless of what Chávez might have failed to deliver on (crime, food sovereignty, housing, infrastructure, allegations of corruption), his electoral base still trust him and are willing to forgive him for his “imperfections”. He has a great ability to connect with low-income voters, who see in him somebody who has their best interests at heart and their first leader who uses the state apparatus for the country’s benefit rather than personal gain. Fears of an uncertain future if Capriles had won – the army had made some fairly ambiguous (and contradictory) statements as to what they would do if Capriles won and Chávez repeatedly said civil war would ensue if the opposition won – likely played a role in moving undecided voters. Chávez also benefited from his “lock” on the vote of public sector employees. While the opposition claimed it had a hidden vote with public sector employees, the government had a lock on this vote. There were rumours of intimidation, with public sector employees allegedly threatened to be fired if they voted against and others compelled to sign a pledge that they would vote for Chávez. However, even if Chávez probably have an unfair advantage in the campaign and the process, the vote was free. The new electronic voting system was regarded by almost all actors as being tamper-proof. The opposition was graceful in defeat, it did not cry fraud as Chávez claimed they would. Capriles quickly conceded defeat and congratulated Chávez on his victory, while noting the importance of the 6 million votes he had won and the need for Chávez to heed the opinion of those 44% who voted against him. The opposition’s result is not excellent, but it is a rather good result. It would have profited more from lower turnout, as in 2007 or 2010, but with nearly 6.5 million votes, it has won the most raw votes in any Chávez-era electoral event. Holding the MUD together for some time might prove difficult, but it can be pleased by its relatively strong performance, even if ultimately insufficient and slightly underwhelming. Even Chávez, who had styled his opponent as a “mediocrity” at best or a “pig” and “fascist” at worst, was quite conciliatory in victory. While reaffirming his commitment to his platform of “socialism in the 21st century”, he gave signs of reaching out to the opposition. He has an historic opportunity at this point to bridge the gap between the government and its opponents and put an end to the bitter and acrimonious politics which have marked the country since 2002. This election shows that while Chávez remains strong, he is not as unassailable as he was in the past. Rising concerns about crime, inflation, infrastructure, food, housing and corruption have damaged his standing, but as long as Chávez is able to maintain his standing and credibility with his base of lower-income voters, he will remain in a strong position – after all, he wants to remain in power until 2031. However, Chávez’s new four-year term is very uncertain. There is, to begin with, the fundamental question of his health. He has gone through a few operations for his cancer since last June, and while he insists that he is better now, some noted that he was slower and slightly less energetic on the campaign trail. Some have asked, legitimately, if he will survive the entirety of his six-year term. There would be much uncertainty, likely chaos, if he died in office. The law seems to requires a new election within 30 days (!) if he dies in the next four years, and in the meantime the Vice President – appointed by the President – would take power. But the current Vice President, Elías Jaua, seems on his way out and he is not a high-profile figure within chavista circles. In the pre-electoral talk about the eventuality of Chávez not surviving until the election, the names of Diosdado Cabello (the president of the National Assembly) and foreign minister Nicolás Maduro (apparently favoured by Cuba) were mentioned – but the probability of the army moving in to fill the void or even Chávez’s relatives (his brother, governor of Barinas, and his two eldest daughters) making their moves should not be discarded. Questions may also be asked about the survival of chavismo without Chávez. There is no natural heir to Chávez, certainly not one with his charisma and formidable ability to connect to poorer Venezuelans. Regardless, he also faces growing economic problems. While Venezuela’s oil wealth remains solid, rising inflation and the ever-increasing debt are causes for concern. Economists seem to predict that the country will inevitably need to devalue its currency soon. Others naturally worry about the government’s dependence on a single source of income (oil), one which is particularly prone to wild fluctuations and volatility (though the future for the country seems bright with oil prices remaining high). The map was a blowout for Chávez, Capriles won only two states (and not the ones you would have expected) – Táchira and Mérida. Capriles won 56.3% in Táchira and 51.1% in Mérida, he came close in his homestate of Miranda (49.5% against 50%) and Lara (48.5% against 51%). Most surprising was Zulia, where Chávez won 53.3% against 44.1% for Capriles, which is better than what he had won there in 2006 (51%), and he had lost the state in 2000. It is understandable in part given that Chávez’s 2000 and 2006 opponents were both former governors of Zulia, but the state has generally tended to be an opposition stronghold even in the absence of a local favourite son (such as the 2009 referendum). Táchira and Mérida have also been traditional bastions of opposition strength, Chávez had already won them by tight margins in 2006 and both states had voted No in 2009 (with Zulia, Miranda and Nueva Esparta). In these states, Capriles and the opposition found their core strength in the respective state capitals (64% in Libertador, the city of Mérida; 68% in San Cristobal in Táchira). These cities specifically have very low levels of poverty and they have an economy apparently based around small and medium businesses, the state of Táchira seems notably reliant on cross-border business with Colombia. Affluence is of course a major factor, for example, in Miranda, most of the opposition’s strength revolves around the wealthy suburban communities of Caracas, notably Chacao (81.3% for Capriles). A surprising underperformance for Chávez is Amazonas, usually one of his strongest states, but he won only 53.5% in the remote jungle state this year. Otherwise, however, Chávez found strong support in rural regions (including los llanos) and lower-income areas in major cities – Chávez won 54.9% in the capital district after all. The opposition needs to break into these chavista citadels if they are to win. Chavismo, for good or bad and for better or worse, remains dominant in Venezuelan politics, but it is no longer the unshakable force it used to be. The opposition found itself a strong candidate this year, who led a strong campaign, and while they fell short by quite a bit, they seem to have entrenched themselves as a solid and, for many, credible, opposition to Chávez. With Chávez’s health problems and other factors, however, the country’s political future is uncertain. Legislative elections were held in Georgia (the country – not the state) on October 1, 2012. All 150 members of Georgia’s unicameral Parliament were up for reelection. This election follows some major amendments to the Georgian constitution and a change in the electoral system. According to amendments passed in 2010, the President of Georgia will eventually – by the beginning of the next term (due after the October 2013 presidential election) – be reduced to a ceremonial role while the Prime Minister and Parliament will assume more powers, seemingly with the obvious aim of transforming Georgia into a parliamentary republic. The new electoral system has 77 seats elected by proportional representation (with a 5% threshold) and 73 seats elected by first-past-the-post. The 73 district seats seem to correspond to the second-tier administrative divisions (the districts), which would explain the huge malapportionment (the cities being badly underrepresented, as this map shows). Since 2004, Georgia has been governed by Mikheil Saakashvili, who came to power shortly after the 2003 Rose Revolution removed Eduard Shevardnadze from office. Saakashvili, a young anti-corruption reformist, had briefly served in Shevardnadze’s cabinet before becoming one of the major leaders of the opposition in 2001. By 2003, Shevardnadze’s government, in power since 1995, had become extremely corrupt and had clear authoritarian inklings. The 2003 legislative election, allegedly rigged to allow Shevardnadze’s party to narrowly defeated Saakashvili’s opposition party sparked the Rose Revolution. In 2004, Saakashvili was elected President with 96% of the vote. Saakashvili, which has sought to cultivate the image of a young pro-Western (which entails, in this case, pro-American, pro-European and pro-NATO) anti-corruption reformer, has a mixed and controversial record in power. On the overarching issue of corruption, a problem which every Georgian government has faced, while some of Saakashvili’s efforts to curb corruptions were lauded by the international community, at the same time he has been accused of corruption by opponents and foreign observers. His economic policies have freed the business climate in Georgia and have received warm acclaim abroad, but at homes critics point to the high unemployment (16%) and deep poverty in rural Georgia, which has not benefited from his modernization program. Saakashvili placed his country on the map in 2008 when the Georgian military invaded the breakaway republic of South Ossetia. Since independence, Georgia has had only incomplete control over its territory, with the breakaway republics of Abkhazia and South Ossetia – two regions home to ethnic minority groups – causing headaches for every Georgian government. Both of these internationally unrecognized republics are described as Russian puppets (especially South Ossetia); indeed Russia is the sole major international power which has granted recognition to those countries and Moscow has clear interests in both: Abkhazia for its access to the Black Sea and South Ossetia because gas and oil pipelines transit through it. Saakashvili had already faced a potentially explosive situation in 2004 when Aslan Abashidze, the local pro-Russian strongman of the autonomous region of Adjara in southwestern Georgia, refused to submit to the new Georgian government. He avoided armed confrontation and was able to lead the issue to a peaceful resolution with Abashidze’s resignation. In dealing with the breakaway republics, he had favoured diplomacy until 2008, when he ordered the invasion of Tskhinvali in South Ossetia following border clashes. Georgia’s military was no match for Russia’s military, which quickly pushed back the Georgians. The war ended as a disaster for Saakashvili, with the peace deal signed in August 2008, Georgia lost control of parts of South Ossetia and Abkhazia which had remained under its control. Saakashvili has faced an often divided but very feisty opposition, which has often resorted to street demonstrations after failing to defeat Saakashvili at the ballot box. While international observers regarded the 2008 presidential and legislative elections as acceptably free and fair, the opposition has accused Saakashvili – perhaps not entirely unjustly – of abuse of power and authoritarianism. It is true that Saakashvili is known for his arrogant, vindictive, erratic and slightly autocratic tendencies and he has not quite transformed his country into a “Western democracy” since 2004 – it still has “partly free” ratings on press freedom, political and civil liberties and the Democracy Index rates it as a “hybrid regime”. His regime faced large protests organized by the opposition in 2007, 2009, 2011 and 2012. The opposition to Saakashvili is extremely heterogeneous and generally noted for its internal squabbling. It unites a wide range of personalities, ranging from supporters of the former regime to right-wingers to left-wingers to nationalists to former allies of Saakashvili (including Nino Burjanadze). A lot of politicians in Georgia have been business tycoons. The 2007 protests were led and organized by Badri Patarkatsishvili and the runner-up in the 2008 election was Levan Gachechiladze, two business tycoons who had large stashes of cash backing them. The new opposition coalition this year, Georgian Dream, was no different. Georgian Dream is a coalition of different parties, but it is steer-headed by a billionaire, Bidzina Ivanishvili, who is a French citizen (he recently relinquished a Russian passport) after being stripped of his Georgian citizenship in 2011, allegedly for breaking dual citizenship laws but probably because he was entering politics. Ivanishvili made most of his money working in Russia, in a wide variety of sectors during the lucrative privatization era in the 1990s. Georgian Dream is a heterogeneous movement. The Economist noted that “Mr Ivanishvili’s ragtag coalition is united mainly by his own largesse. Its ranks include xenophobes, chauvinists and those nostalgic for the old days, partly constrained by some distinguished pro-Western liberals who fell out with Mr Saakashvili.” The coalition’s platform was terribly vague, Ivanishvili said his sole priority is “happiness for all” and he has promised a wide range of goodies: more jobs, medical coverage, more schools, better pensions and a freer press and judiciary. The governing party – the United National Movement (UNM) – was similarly vague in its policy orientations. Its economic policies do not seem vastly different from those of Ivanishvili’s coalition, which is hardly surprising given that what divides the two parties are personality and power struggles rather than ideological disagreement. On foreign policy, the government promotes itself as pro-Western and pro-NATO, but Ivanishvili similarly supports NATO membership and closer ties with the west – all while also wanting closer ties with Moscow (which has led to Saakashvili accusing him of being a Russian stooge). The campaign, as all electoral campaigns in Georgia, was very bloody. The two sides lobbed insults at one another, the opposition apparently refers to Saakashvili as “the rat” and has branded him a fascistic tyrant. The turning point during the campaign was the revelation of a video which showed prisoners being tortured and beaten up by prison wardens, the outrage forced a cabinet minister to resign and analysts have said that the outrage allowed Ivanishvili’s opposition coalition to take the lead. The results were as follows, for the PR and the FPTP seats. Turnout was 59.76%. The election, largely free and fair, resulted in the defeat of Saakashvili’s party and the historic victory of the opposition. Though Saakashvili originally held out hope that the UNM would be able to win by virtue of the district seats, but he quickly gracefully conceded defeat to the opposition. The opposition was not as gracious in victory, Ivanishvili originally called on Saakashvili to resign before quickly backtracking on that statement. The country enters a funny transition period, Saakashvili will remain President until the October 2013 presidential election while Ivanishvili will become Prime Minister. The new parliamentary-type regime is due to take effect following the October 2013 election, between now and then Ivanishvili and Saakashvili will need to learn to work together. Ivanishvili will also need to learn to accept a strong parliamentary opposition, something which the UNM lacked in the last parliament. Ivanishvili likely has a tough road ahead of him. His rag-tag coalition is held together in large part by his cash and a mutual hatred of Saakashvili, but they might find it very hard to stick together once in power, similarly to how Saakashvili lost a lot of his original 2004 allies during his presidency. Some will justifiably worry about the type of leader Ivanishvili will turn out to be. Will he continue the imperfect reformist path of Saakashvili or will he go down the road to crony capitalism, entrenching a regime of oligarchs? His platform was unbelievably vague, which means that few know exactly what he wants – besides happiness, a fairer society and a pro-Western foreign policy (all while being more pro-Russian than Saakashvili). The maps to the right, drawn up by a friend of mine, show the results of the PR and FPTP votes by district. The opposition’s stronghold was the capital, Tbilisi, where it won upwards of 70% of the vote. Tbilisi has traditionally been a stronghold of the anti-Saakashvili opposition, for example in the 2008 election, the capital was one of the three districts which he lost. The opposition is also traditionally strong in a few districts bordering South Ossetia (some of these districts are only partly under Georgian sovereignty). The UNM’s strongholds correspond to those districts where Saakashvili polled best in the 2008 elections. These include a large block of districts south of Abkhazia, a region with a large Mingrelian (and Svan) population (a Georgian subethnic group); and border regions in the south of the country, including a few districts with Armenian and Azeri majorities. Regardless of the nature of this election or the country’s future, it is refreshing to see democratic elections of this kind in the former Soviet Union which result in the peaceful transfer of power. At least the voters had a choice, even if this choice is perhaps was not what some would wish it was.